The first thing to note is that I save all bits and pieces that I try, then decide against. 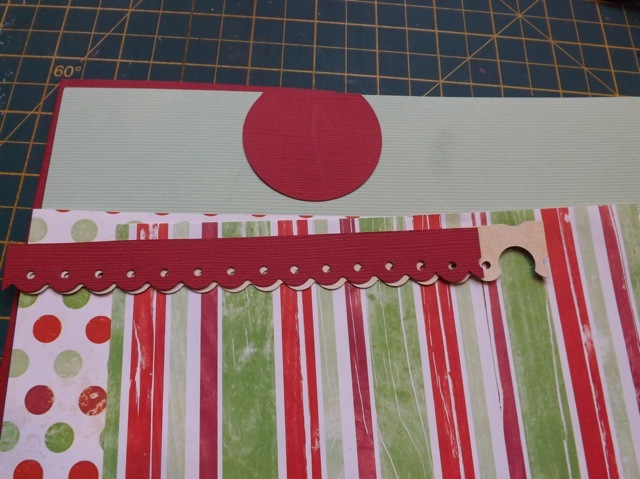 Best shown here by the scalloped strips, but if I punch or die cut a shape, then don’t use it, that goes in the scrap bin as well. I don’t have a photo of it, but I have a little bowl on my desk that I put all circles that are the result of a border punch (I have one that punches a really BIG circle) or a single or a three-hole punch. 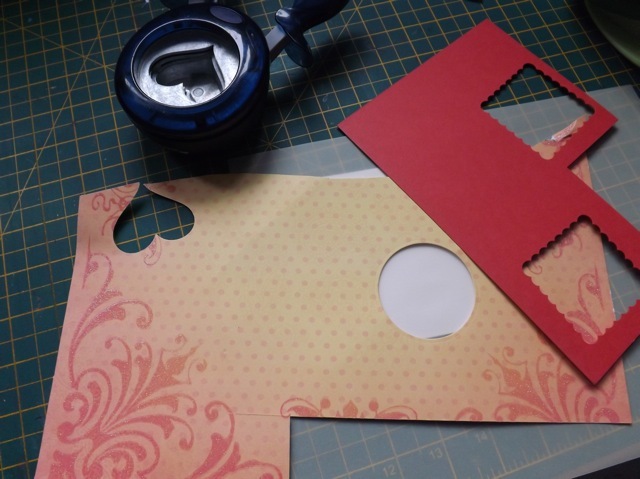 I am always fishing out circles to use from it – they are great for adding to a tag then punching the hole thru for a ribbon hole that doesn’t look “raw,” IYKWIM. 2. 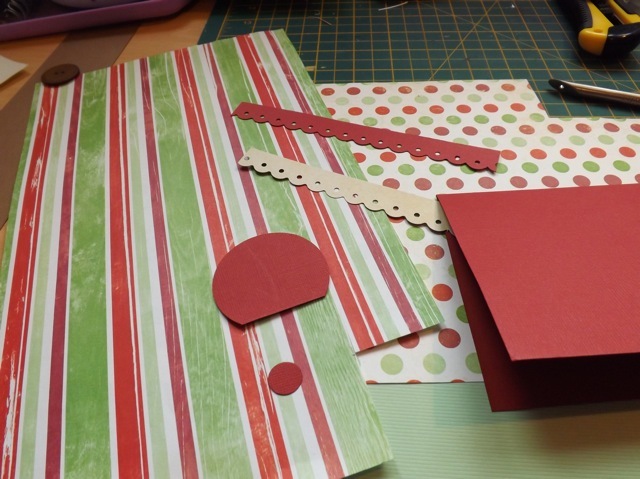 Really LOOK at your scraps – note any punched areas or borders that you can use. Let’s look at Card One. 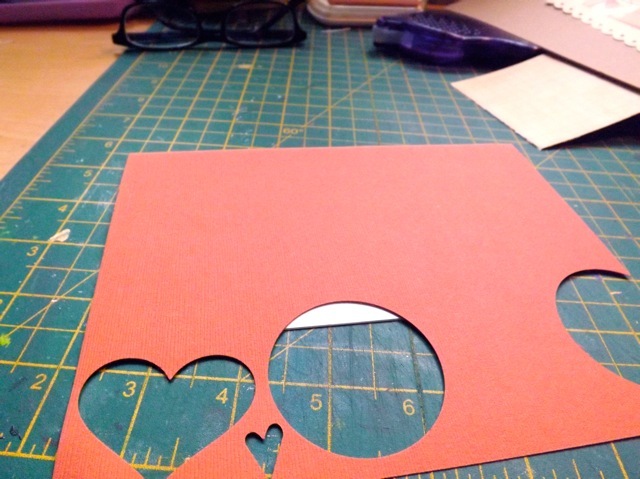 I had both a punched heart and that large bit of card with the circle punched out of it. a bit of vellum and some small scraps of yellow. 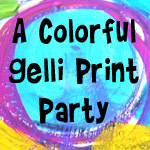 The edge of the cardstock still had a bit of the printed border and corner on it. 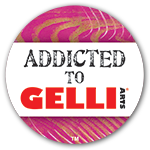 I liked how careful placement of the corner pattern formed an arrow, pointing towards the sentiment. See it? I didn’t capture the whole process, but note the button is filled with one of those little punched circles from my bowl. 3. For Card Two I decided on a Birthday card – probably for one of the many near-Christmas birthdays we seem to have in the family. 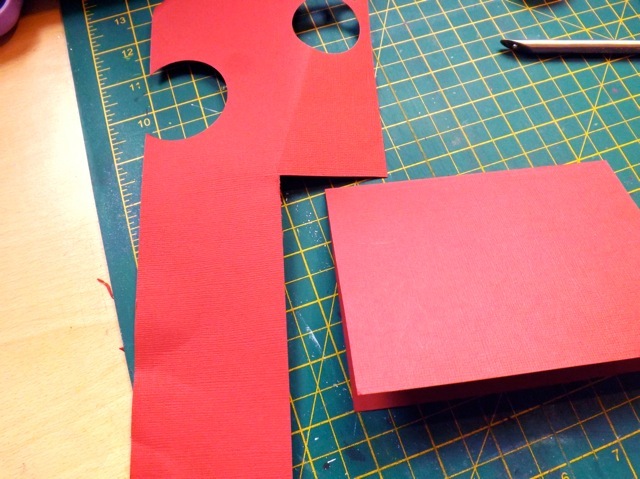 The tip here is to fold a card blank if you are lucky enough to have a piece of cardstock that works, size-wise. I had a large rectangle of the bright red, so perfect. 4. 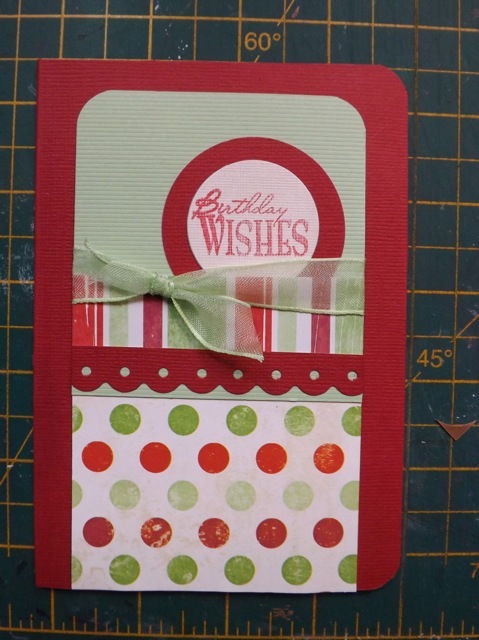 If you can create something using the bits that square off your paper or card, do it. What I mean by that is if you have a mostly square piece and you can lop off the extension, look first at how you can use that bit. Unfortunately the photo doesn’t actually show all the hanging off bits, so you’ll just have to trust me on this. My reasoning for that is that I don’t want to create MORE scraps. If I can use up the better part of a chunk then I might be left with something I am happy to throw out. Start layering things – see what you can come up with. I love dots and stripes together so this was perfect. The card? All the big bits are squared off. 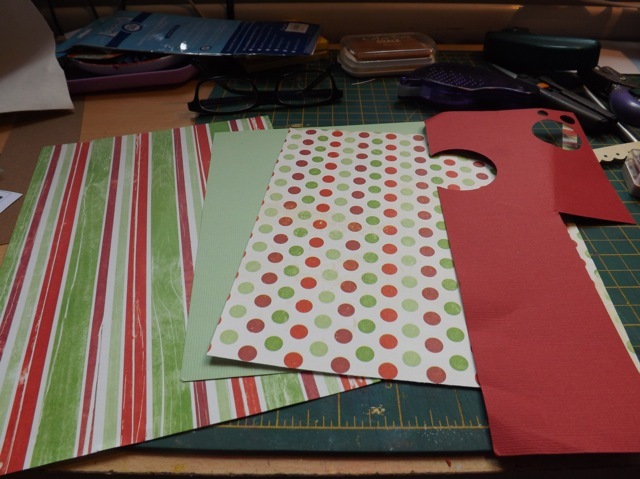 The pale green is big enough to make another card blank and I could even use these scraps to get a whole other card. 5. 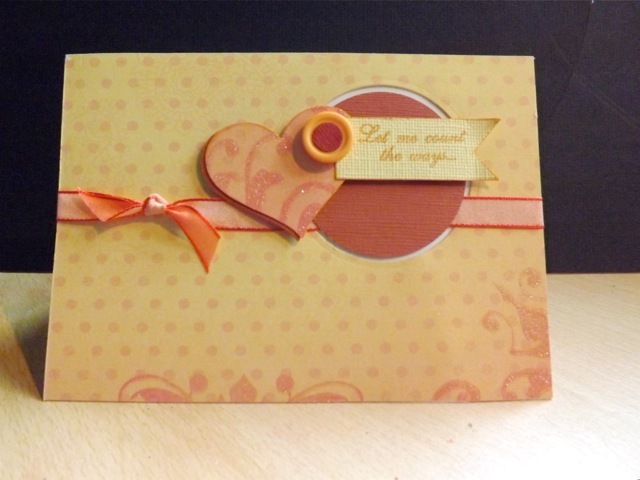 For Card Three, my tip is Use a piece that ALMOST covers a card front and hide the flaw. You can see that the cardstock has a bit punched out but mostly covers the card front. I could have tried to use the punched out area as a feature but I already did that on the first one. THIS one, the missing area was pretty small so I just covered it. I started moving around the bits till I liked what I saw. And ended up with this! 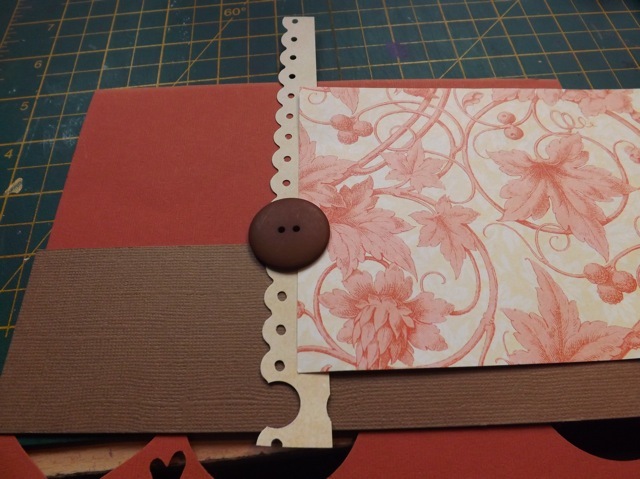 I used almost all of the orange leafy paper, and almost all of the cardstock. 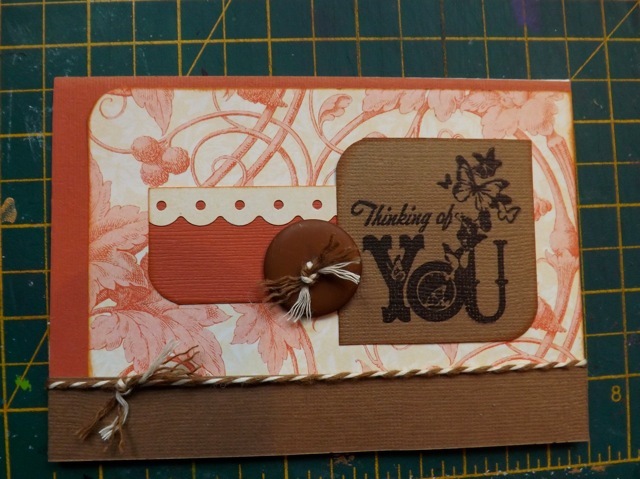 I used a never before inked stamp and a bit of Baker’s twine I had cut then never used. Now these cards are never going to win any awards, but it isn’t about that! It’s about using up scraps in a creative way. Note I say USING UP, not just using. 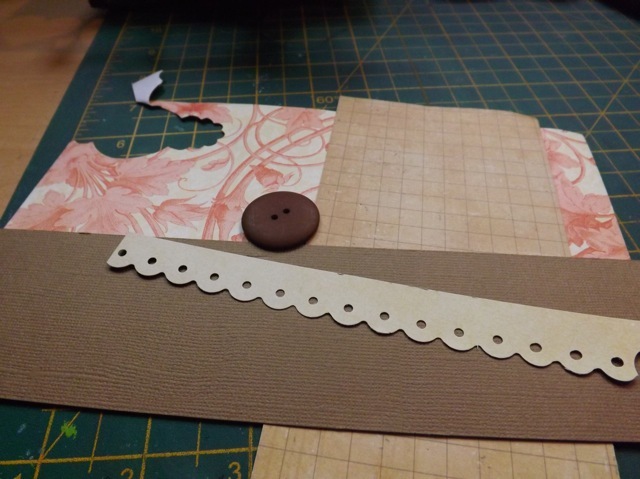 I want to get rid of the scraps, not just make increasingly smaller scraps, unless they are small enough to punch some circles from and then bin the rest. So sometimes there might be a compromise on the design, but I am OK with that. I think this process would be ideal for charity cards, where anything you make is a blessing and turning near rubbish into a decent, if not always stellar, card to sell for charity HAS to be a win/win situation. I hope that all makes sense and maybe that it helps you look at your scraps in a different way. Well I am so pleased you found it helpful, and you took the time to let me know. 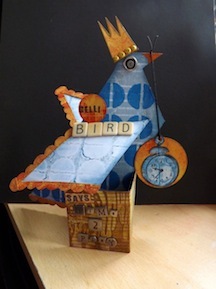 Here’s hoping you make some fab cards with your scraps! Oh that’s fabulous stuff, I too am trying to use up leftovers from layouts as I go at the moment, I’ve set myself the challenge of creating Christmas cards but some of the papers just aren’t apt, hubby yesterday looked over my should and spotted the spring like flowery papers that I was trying to get to work and just said “really” had to convert that one into a normal birthday card LOL! Yes, I think sometimes the hardest thing to do is to abandon something that isn’t working 🙂 I like a challenge and get locked in to the “I can MAKE this work” mode when really I know I save time and stress by realizing that I’d be better off just moving on!